Today’s guest is Vishy from Vishy’s Blog. Vishy used to work in the technology industry managing projects, but these days he spends his time mostly in reading great literature, expanding his horizons in new areas (his current areas of interest are Law, Israeli/Jewish history, culture and literature, Abstract Mathematics and Energy), watching his favourite TV shows and the occasional movie and following his favourite sports, tennis and cricket. This is one of my all-time favourite books. The story goes like this. A 40-something-year-old woman is trapped in the countryside. It looks like she has been separated from the rest of the world by a transparent wall or dome. On the other side everyone is dead. The woman has a dog, a cat and a cow for company. With this minimalistic setting, Marlen Haushofer creates literary magic weaving in all the grand themes — the relationship between humans and animals and the environment, the relationship between parents and children, between men and women, and the idea of freedom, love, loss and death — in beautiful, gorgeous prose. Haushofer is Austrian and only three of her novels have been translated into English, which is unfortunate, because she is one of the greats. She deserves to be more well-known. The Wall is a masterpiece and deserves to be more well read. This is my favourite collection of essays ever. 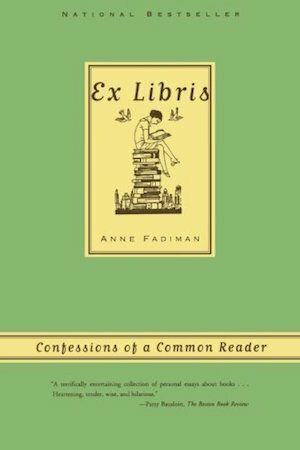 In this book, Anne Fadiman takes all the things that delight booklovers and writes an essay about each of them. Topics covered include how to treat a book (whether dog-earing a page is okay), second-hand bookshops, reading a book together with our favourite person, the hidden-but-favourite part of our bookshelf and other delightful bookish topics. This book is a book lover’s delight. Why is this a book that changed my world? Harold Bloom says this about poetry — that it augments our consciousness. This book, Fadiman’s collection of bookish essays, augments my consciousness, sharpens my bookish vision, enriches the way I look at things. I used to think that I was the only person who thought about dog-earing pages, or spilling coffee on a book, or having a secret part of my bookshelf which I treasure, but which I don’t want others to see. Fadiman made me realise that there are other readers like her who think about these things, who are as bookish as I am. This makes me happy, this makes my heart glow with pleasure, this enriches the way I look at bookish things, and in that way this book has changed my bookish world and life. 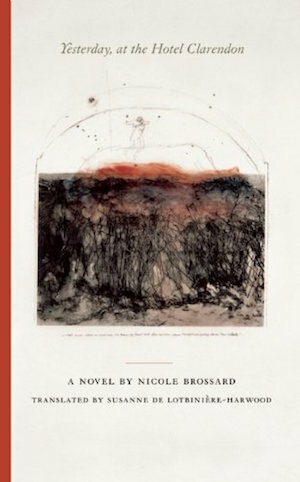 Nicole Brossard is virtually unknown outside her native Canada and even there she is known only among a select group of readers. When it is assumed by default that Canadian literature is written in English (Margaret Atwood, Alice Munro), it is forgotten that there is a beautiful part of Canadian literature written in French. Unfortunately, even Canadian readers ignore the French literary treasures from their country. Nicole Brossard is Canadian and writes in French and she has been doing that for more than fifty years. She is a poet, novelist and essayist and the beauty of her poetry flows into her prose. In this novel, Brossard’s prose is sublime, gorgeous, intoxicating. It is the kind of intoxication that one gets while listening to classical music, the kind which is pleasurable and exhilarating and delightful but on which one never gets drunk. Brossard deserves to be more well-known and more people should be reading her works. I highly recommend this book. Thanks, Vishy, for taking part in my Triple Choice Tuesday! This is why I love asking bloggers to name three books that are important to them, because you’ve chosen three titles that I have never heard of and which I want to buy and read immediately! What do you think of Vishy’s choices? Have you read any of these books? How wonderful to see Anne Fadiman’s book here! Ex Libris is indeed such a lovely read, as is her other essay collection At Large and at Small. Her book The Spirit Catches you and You Fall Down is one of the best non-fiction books I’ve ever read. I am a total Fadiman fan and so glad to see her praised here. So happy to know that you love Anne Fadiman too, Christine 🙂 I love At Large and At Small too. I haven’t read The Spirit Catches You and You Fall Down yet. Hoping to read it one of these days. Vishy is one my favourite bloggers because when I asked him for recommendations for Indian Lit I should read he obliged with a splendid list which I have been dipping into ever since. Thank you for your kind words, Lisa 🙂 Glad you liked those Indian literature recommendations! Hope you like the above three if you get to read them. I would love to hear your thoughts. Vishy’s a good source for book recommendations so these three unknown-to-me books must be good. I’ll have a look at the Brossard and the bookish one tempts me as well. Thank you for your kind words, Emma 🙂 I hope you like the Brossard book. I have heard that the prose is even more beautiful in French. Happy reading! I’m very glad that I just picked up that copy of Ex Libris – I’m looking forward to it more than ever! And Vishy’s right about Nicole Brossard and so many other French writers in Canada. Of course, those of us who speak only English (which is probably most of us, although that is changing with all the French schools and French immersion programs) have to wait until there are translations of the French books. But, even then, they are not commonly known. Another Quebec author that was recommended to me by Vishy about a year ago is Denis Theriault. I finally got around to reading his novella ‘The Peculiar Life of a Lonely Postman’ last month, and loved it. I really have to get to ‘Yesterday, At the Hotel Clarendon’. Thanks for the great recommendations, Vishy! So wonderful to know that you got Ex Libris recently, Naomi! So jealous that you are going to read it for the first time! Happy reading! So wonderful to know that you liked Denis Thériault’s The Peculiar Life if a Lonely Postman. It is one of my favourites. Hope you get to read Brossard’s book. Her prose is so gorgeous! Thanks so much for hosting, Kim! 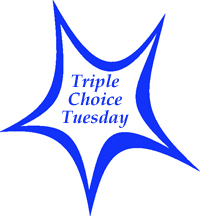 I love Triple Choice Tuesday and I enjoyed writing about three of my favourite books! You’re very welcome! Thanks for choosing such interesting titles. What wonderful and unusual choices – two of them completely new to me and one (the Austrian one, yes) I’ve been meaning to read for ages. Thank you, Vishy, for introducing me to new authors. 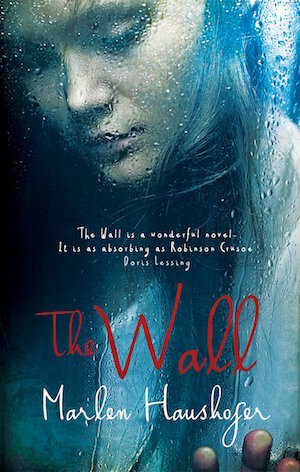 So happy to know that The Wall is there on your TBR list, Marina! It is one of my alltime favourites. Hope you like it. I will look forward to hearing your thoughts on it. Happy reading! Great post! Ex Libris looks like it would be right up my alley. I’m also the happy owner of a copy of Ex Libris; Vishy has reminded me to drag it out & read it again. Great post. Nicole Brossard certainly sounds interesting! I’m late to this but really love these choices. I haven’t finished Fadiman’s book yet but what I read so far is wonderful. And so is the wall but I don’t know Brossards’s book yet.